In 1872, Auguste Renoir moved to 74 rue Saint-Georges, a street off one of the new great boulevards of Paris. It would be the center of his life for the next decade, and a meeting-place for his friends and colleagues. He painted some of his most memorable pictures there—including this lively group portrait, a typical gathering of good friends engaged in conversation. On the far left is the painter Pierre Franc-Lamy. The art critic Georges Rivière looks out at us; he would later be Renoir’s biographer and would pen one of two descriptions of this picture identifying the figures. To the right, the balding man in profile is the older painter Camille Pissarro. The men beside him are believed to be the composer Ernst-Jean Cabaner; and with his back to us—holding a cigarette—is Eugène Lestringuez, a civil servant who shared Renoir’s interest in the occult. According to another account of the picture, this figure may also be the famous writer Alphonse Daudet. In either case, the assembly of contemporary artists and intellectuals puts forth Renoir’s refined sensibility over any bohemian artist’s life. The composition is woven together and animated by the kind of rapid energetic brushstrokes that the Impressionists—including Renoir—were beginning to use for outdoor paintings. Renoir often preferred to paint in his studio. His approach was far from traditional, however. Most artists posed their subjects for many hours. 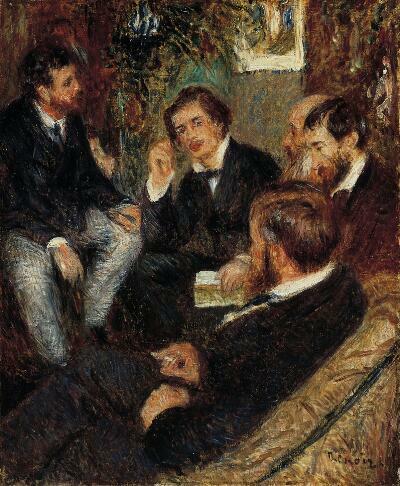 But Renoir painted his quickly; he could finish a portrait at a single sitting. He disliked professional models, and relied heavily on his friends—and later, his family—to sit for him.